Feb. 11, 2015, 4:57 p.m.
One question that’s been asked a lot since Jeff Bezos bought The Washington Post is how involved he is in the newspaper’s evolution. Bezos hasn’t spoken in much detail about the subject. (One of his relatively few public comments about his ownership starts at 42:45 of this Business Insider video.) Media references to the Post’s real successes of the past year sometimes seem to give credit to his magical touch — but how engaged is he, really, given that other pretty big company he owns? I took over as design director right as Jeff Bezos bought the Post. In a few months I'd be talking to him regularly about new products. Our task was to redefine the news tablet app experience. Nationally-focused Post content. Be simple. Be great. No noise. No pressure? Our job for the next year would be interpreting Jeff and our exec team's design input. It was a grueling pace for everyone. Everyone was working hard but design was what everyone saw. I lived two weeks at a time hoping Jeff would like the next thing. I once worked all night while at a conference in Singapore to figure out a feature. It's too embarrassing to say what it was. My team and others went through more than 20 concept pitches until Jeff picked one half of one concept. Quickly we started building, tweaking, experimenting. Then hiring the staff that produces the app. Because the app was so simple everyone wanted to add something. We protected it though. Even Jeff from his own idea at times. I must pause to say w/o my bosses, my team and many others we couldn't have done it. @garciaruize kept me sane. The award-winning journalism you see in the app and the hard work put into creating it is the new daily (twice!) miracle. Don't let the design focus be mistaken. The fact it is super fast. Barely any crashes. Clear editing. Presentation. Design is all of that. That's the shortest version of that story but that's also only the beginning of our wild year. Pt. 2 tomorrow. Two quick thoughts. 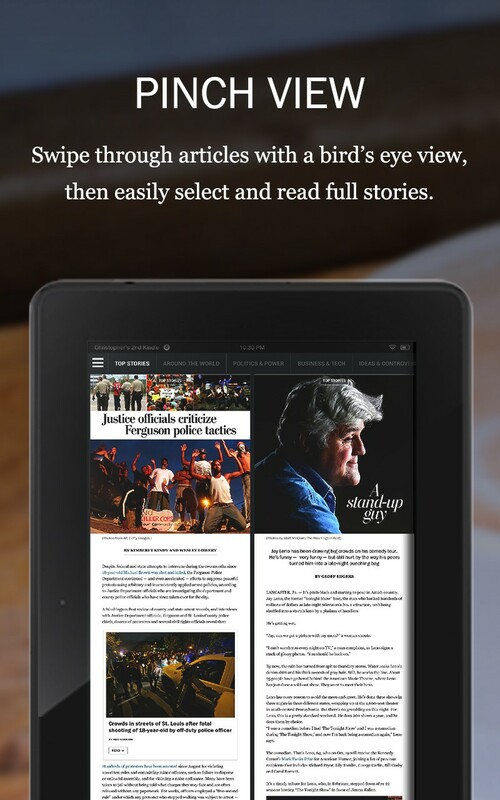 First, the Kindle Fire app they built is an nice piece of work, with an interesting UX and a twist on the linear-reading model a print newspaper offers. But you probably haven’t heard much about it since its release — because it’s locked on the Kindle Fire, a tablet not that many people use, but which Bezos’ other company happens to make. In business, they call it a strategy tax when something makes a product less likely to succeed but advances larger corporate goals. (Think Microsoft refusing for so long to release Office for iOS, where it likely would have been a success, because it wanted to prop up its own Windows mobile platforms.) I don’t think it’s a stretch to say there is zero chance this would have launched exclusive to the Kindle Fire if Jeff Bezos was not the owner of the newspaper. It’ll be worth watching to see to what degree future interesting Post work gets constrained to Amazon platforms. Second, if you haven’t already, read this Fast Company piece from last month — on what went wrong with the Amazon Fire Phone — for a different vision of Bezos’ involvement in product development. Benton, Joshua. "How involved has Jeff Bezos been at The Washington Post? Here’s one data point." Nieman Journalism Lab. Nieman Foundation for Journalism at Harvard, 11 Feb. 2015. Web. 19 Apr. 2019. Benton, Joshua. "How involved has Jeff Bezos been at The Washington Post? Here’s one data point." Nieman Journalism Lab. Last modified February 11, 2015. Accessed April 19, 2019. https://www.niemanlab.org/2015/02/how-involved-has-jeff-bezos-been-at-the-washington-post-heres-one-data-point/.